How to get to Pender Island? One of the things we love about living in British Columbia is its ability to consistently deliver awesome travel experiences. Our trip to Pender Island was yet another reminder that we need to invest more time exploring our home province. It continually surprises us. Earlier this year we created our personal goals for 2017. One of Nicole’s goals for 2017 is to visit another island on British Columbia’s coast. There are so many islands in the Pacific Northwest that we still want to visit, so we made this a priority and put a few feelers out to the universe. 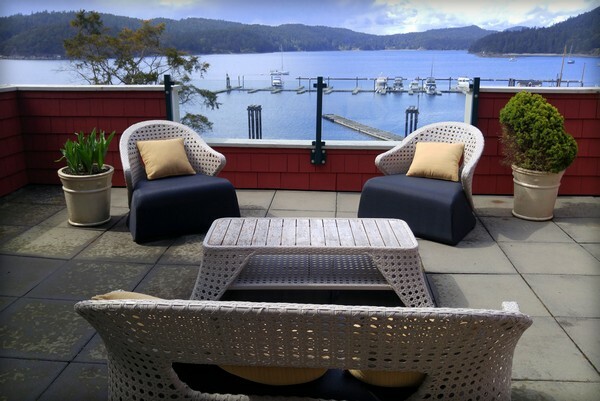 We connected with the good people at Poets Cove Resort and Spa on South Pender Island and decided it was time to put our plan into action. South Pender Island is part of the Southern Gulf Islands archipelago and the closest Gulf Island to the U.S./Canada border. It’s connected to North Pender Island by a single land bridge. 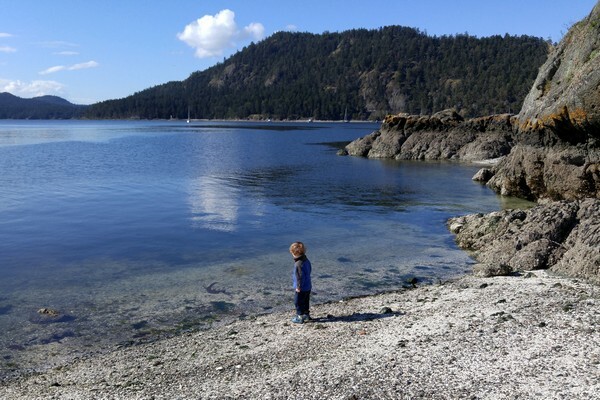 To maximize our time on South Pender Island, we decided to visit over the Easter long weekend. It’s one of the ways we’re able to create more travel experiences with the same amount of vacation days (learn more by reading this post). 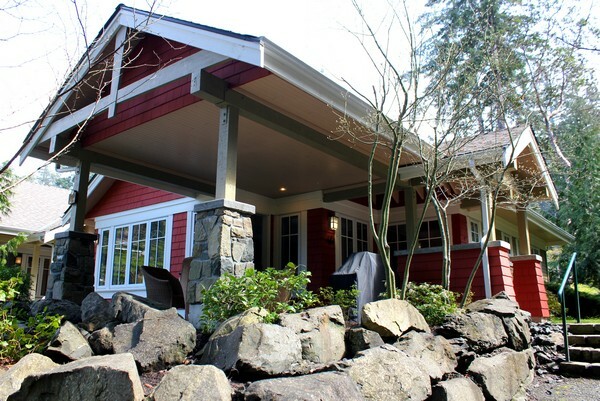 We spent 3 nights in a spacious private cottage at Poets Cove Resort. It’s a beautiful resort that overlooks Bedwell Harbour and the marina. The property is nestled in a cove that’s relatively isolated, so you’re forced to slow down and soak up the laid-back Gulf Island vibes. We captured some video footage that we recently uploaded to our YouTube channel. For those of you that are curious about Poets Cove, we will write a more in-depth blog post about the resort soon. In the meantime, below are a few photos of the resort and the spectacular views of Bedwell Harbour. Views of Bedwell Harbour and the marina from the lobby balcony at Poets Cove. 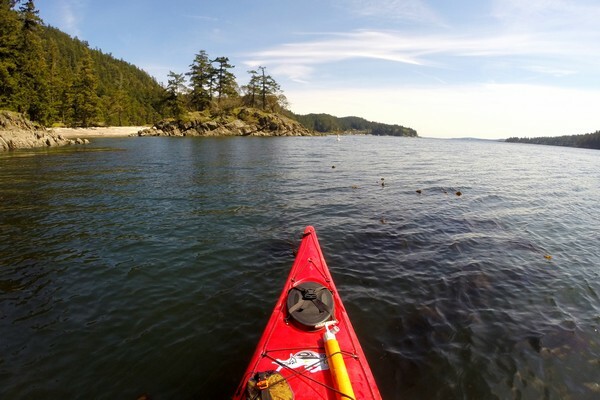 The Gulf Islands offer some of the best paddling in the Pacific Northwest. 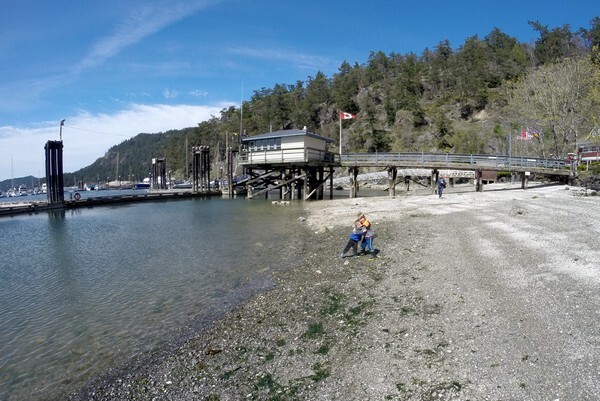 Beaumont Marine Park, located on the west shore of South Pender Island in Bedwell Harbour, is one of the most popular marine parks in the Gulf Islands. It’s a short paddle from Poets Cove to Beaumont Park and there are several beaches along the shoreline. The area is part of the larger Gulf Islands National Park Reserve, one of Canada’s newest national park reserves. The reserve protects over 15 islands and the surrounding islets and reefs. 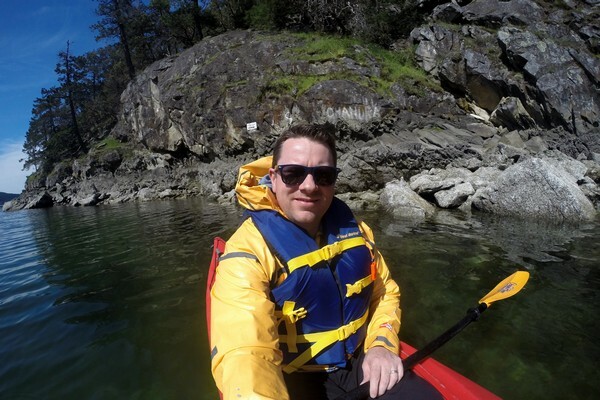 You can rent kayaks and canoes from Dog Mermaid, a local company that offers equipment rentals and guided excursions. The kayaks are located at the beach in front of Poets Cove. In the off season, you’ll need to call ahead to book the kayaks. Here are the contact details. The beach on the horizon is Beaumont Marine Park. The water in the marine park is super clear. I was able to see about 15 feet below the surface. A highlight for Braydon (and Nicole) was searching for sea creatures at low tide. The water retracts quite a bit on the coast, revealing the ocean floor and hundreds of little tide pools. We saw plenty of little crabs (and big ones), purple starfish, thousands of barnacles and a baby eel. This big guy was stuck in a hole near the rock face. He appeared to be dead, but when Nicole picked him up he moved slowly. He must have struggled to climb out of that hole. High tide would not have reached him, so he likely would have died or been eaten by a bigger animal. We put him back in the water and within a few minutes he had wandered off. At high tide, this beach is completely covered by water. Thousands of barnacles and mussels are attached to this rock formation. A trio of purple starfish protect themselves in a shaded crevasse at low tide. Look at all those barnacles! It’s quite the sight, actually. This massive rock formation is teeming with sea creatures and wildlife. Braydon found a few more starfish clinging to sides of those dark holes in the rock. He was pretty excited about that. He felt like he was on a sea creature scavenger hunt. This strange looking crab was already dead when Braydon found him on the rocky beach. I don’t know what the heck this is, but it’s some kind of spongy sea creature. Anyone? Poets Cove faces west, which means it’s perfectly positioned for evening sunsets. It was overcast the first night of our stay, but we were treated to soft pastel sunsets the other two nights. The marina and calm water create a stunning landscape. The evenings are so peaceful and quiet on South Pender Island. The Enchanted Forest is within walking distance to Poets Cove Resort. It’s a relatively small forest that has a network of trails and bridges that connect to each other. The walk to the forest from Poets Cove is straight uphill and on the main road, so we decided to drive to the entrance instead. It’s only a 3 minute drive from the resort, but we didn’t want to risk burning out their little legs before we had a chance to visit the forest. The forest trails are an easy walk. Bring proper shoes, there are slippery and muddy sections. Brotherly love. The Enchanted Forest is a fun walk for little ones. This is the main road that takes you to and from Poets Cove. As you can see, things move a little slower over here. The main trail in the Enchanted Forest ends at the side of this road, so you have to either turn around or walk back along this road to the forest trail entrance. Did you know there are wineries on the Southern Gulf Islands? We didn’t! It was a nice surprise to learn that we could go wine tasting during our visit to the Pender Island. The Sea Star Winery is located on North Pender Island, on the eastern side. The winery owns two vineyards; a seaside vineyard that cascades down to the beach and an upper vineyard that terraces up to Mount Menzies, which is part of the Gulf Islands National Park Reserve. You can purchase wine directly from the tasting room. Check the hours of operation before you go. We were told that the winery is not open during the winter months. 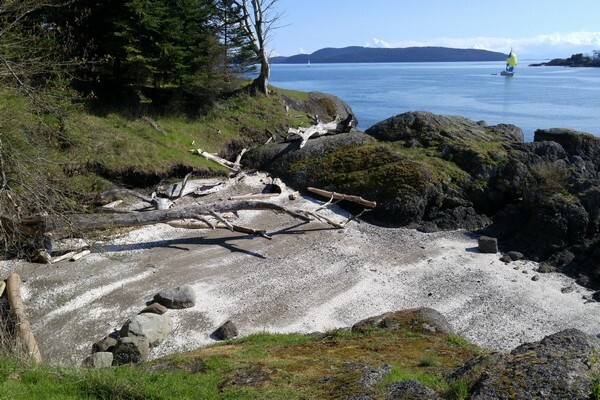 The Gulf Islands are filled with coastal trails and secluded beaches. During our stay at Poets Cove we found a trail in front of our cottage that leads to multiple beaches. We made it a daily ritual to wander down to these quiet beaches to take advantage of our surroundings. The best part is that you have these beaches and coves all to yourself. We rarely ran into other people. Our boys had so much fun turning over rocks in search of baby crabs. We threw stones in the ocean and listened to the birds sing. 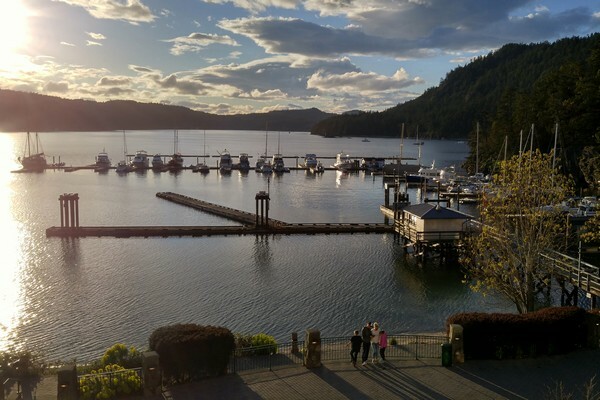 Pender Island is the perfect place to connect with nature and recharge your batteries. We spotted two little garter snakes on this section of the trail. Connor wasn’t sure if he should be excited or terrified. This was the first time he witnessed a real snake in the wild. Within seconds the snakes quickly disappeared into the thick grass. He was okay with that. The coastal landscapes are incredible. We even lucked out with a little sunshine. The water in the marina is surprisingly calm. Especially in the morning. Marina reflections. The calm morning water was like a mirror. This is the Canada Border Services Agency building. Not a bad place to be positioned if you’re a border security agent. Sure beats the chaos of the Vancouver International Airport! We really enjoy the pace of Pender Island. Everything moves a little slower. Nobody is in a rush. There are no traffic jams or long line-ups. People seem genuinely happy and relaxed. Every time we visit the Gulf Islands we can feel the tension in our shoulders disappear the moment we drive off the ferry. A sense of calm washes over us. I don’t think we could live here full time (we do like the city life), but we’re always grateful to spend time on the islands. Braydon wanted to be in that hot tub as much as possible. He literally woke up one morning and said, “can we go in the hot tub now?” He didn’t have to beg. We were all over that hot tub too. Pull up a chair. But don’t lean back to hard! We love watching our boys connect with nature. It reminds us of our childhood and takes us back to simpler times. When was the last time you down a beach just because you felt like it? Who doesn’t love a private hot tub?! We visited the island over the Easter Holiday and the fun people at Poets Cove Resort hosted an Easter egg hunt for the little ones. Did you see this video on our Facebook page? Pure chocolate egg panic! Most people will arrive on Pender Island via the BC Ferries. 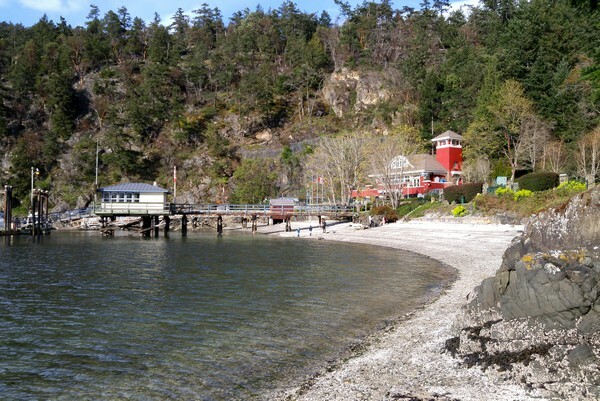 The ferry terminal on Pender Island is called Otter Bay (pictured above). It’s a small terminal with limited facilities. There are no direct ferries to Pender Island from Vancouver. If you’re coming from the Lower Mainland (ie. Vancouver), you will depart from Tsawwassen. The ferry will likely make stops at Galiano Island and Mayne Island before reaching Pender Island. If you’re coming from Vancouver Island (ie. Victoria), you will depart from Swartz Bay. Here’s the ferry schedule to Pender Island. It is highly recommended that you make reservations when sailing from Vancouver to the Gulf Islands. There are limited sailings in the winter months and on weekdays. Plan to arrive at the ferry terminal at least 45 minutes earlier (minimum). If you miss the ferry, there may not be another one that day. We learned something new about the BC Ferries on this trip to Pender Island. Watch this video to learn about the best kept secret on the BC Ferries. You can also catch a float plane to Pender Island. The main airlines are Harbour Air, Kenmore Air, and Seair. Prices and schedules will vary depending on the time of year. There is no public transportation on Pender Island. There is a taxi service, but there are limited vehicles. It’s best to bring a vehicle with you on the ferry.